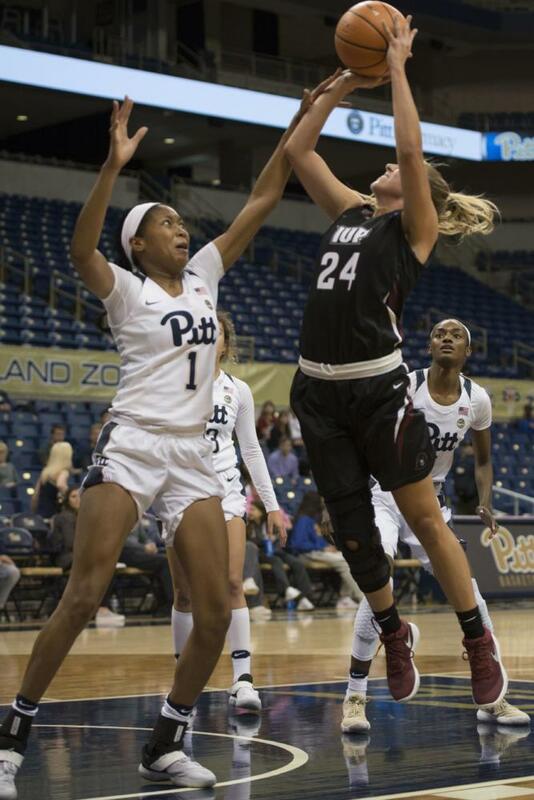 When the Pitt women’s basketball team last faced the Crimson Hawks, the Panthers won the game 72-40. Sunday’s exhibition matchup at the Petersen Events Center was a completely different game. The new team of Panthers fell to Indiana University of Pennsylvania, 73-68, after playing in a game where the score was tied seven times. The game was slow to start, with neither team managing to sink a shot. Pitt redshirt junior Yacine Diop opened scoring when she hit a jumper with 7:31 remaining in the first quarter. Pitt’s lead was short lived, though, as redshirt junior Lauren Wolosik nailed a 3-pointer for the Crimson Hawks less than 30 seconds later. IUP then followed up with four more points from foul shots, making the game 7-2. The Panthers’ defense relied on aggressive man-to-man coverage, resulting in four fouls within six minutes. Sophomore guard Jasmine Whitney picked up two within a minute of coming off the bench. Junior forward Danielle Garven put up her first basket as a Panther with a shot from the paint. A Pitt foul sent Indiana to the free throw line for another two points, putting the Hawks up 9-4. After a layup from Pitt junior center Kalista Walters, Indiana went on a 7-0 run to increase its lead to 16-6 with 3:39 remaining in the opening quarter. Diop ended Pitt’s dry spell with a solid 3-point shot. This marked the beginning of the Panthers’ deficit-decreasing run. Pitt moved within two points of the Hawks with a little more than a minute remaining in the quarter. But when the period closed, the Panthers were at a 4-point deficit, 20-16. Diop was the top scorer for the Panthers, leading the team with nine points including a 3-pointer. IUP junior guard Carolyn Appleby also led her team with nine points. Pitt sophomore guard Alayna Gribble opened up the second quarter with one of her signature 3-point shots. After a successful free throw from IUP, Garven responded with a jumper to tie the game 21-21. The Panthers moved into the lead with a set of foul shots from first-year forward Jaala Henry, but a quick layup from IUP senior forward Megan Smith tied the game once more. At the halfway point of the second quarter, Pitt and IUP were again tied, but at 28-28 this time. Two threes from Wolosik and Smith moved the Hawks back into the lead at 34-28 with 4:17 remaining in the second period. The teams matched each other almost shot for shot in the final minutes, but another jumper from Garven tied the game at 37 as the teams entered halftime. Diop finished with 11 points, going 5-7 from the field and with six rebounds in 17 minutes of play. Garven recorded 10 points, making five of her nine shots, with six points coming in the last two minutes of the half. Gribble nailed the first basket of the third quarter when she squared up at the arc for a three, putting Pitt in the lead. First-year guard Kyla Nelson sank another 3-pointer for the Panthers to put them in the lead 43-38. The game shifted in the Crimson Hawks’ favor with 8:51 left in the quarter. IUP went on a 10-0 run to tie and then recapture the lead at 48-43. After both teams had more scoring success, a layup from Walters tied the game once more. Garven set the Panthers up to end the period with an advantage when she made a jump shot, but a last second layup from Wolosik closed out the quarter 53-53. Diop got into foul trouble early in the final quarter as she picked up her fourth personal foul. The Hawks continued to find success at the basket, recording eight points to Pitt’s four in the first five minutes. With the score at 61-57, McConnell-Serio subbed junior forward Kauai Bradley back into the game. Bradley immediately scored off a jumper to decrease the Panthers’ deficit. The Panthers kept up with Indiana’s scoring and maintained a 2-point deficit until only 43 seconds remained in the game. The Hawks scored with 22 seconds to go, making the game 69-65. Diop tried to drive to the paint but lost the ball and gave up possession. After two clean foul shots from IUP junior forward Brittany Robinson, Whitney drove up the court and hit a late three to put the score at 71-68. Appleby ended the quarter by hitting two foul shots and closing the exhibition game at 73-68. The Panthers take on Youngstown State Friday, Nov. 10, with tipoff set for 7 p.m. This will be the first official game of the 2017-18 season.